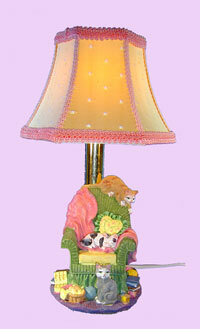 Kittens on a Chair Night Light is my recent creation. 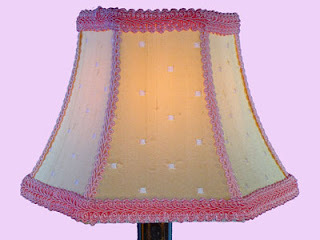 I found the base first and then matched the handmade lemon colored silk shade with pink/peach trim. The shade is hardbacked, not lined. 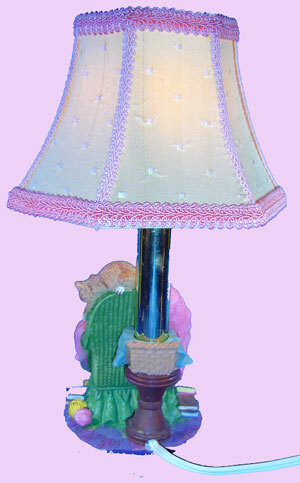 The lamp uses a 15-watt candelabra bulb. 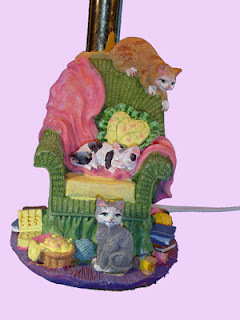 The nightlight measures 11" high. The white cord is 58", almost 5' and has an on/off switch on the cord. I think this base is so cute and I'm not a cat lover. The cat on the top of the chair looks like it's about to leap onto something. The cat in the chair is sleeping; and the one in front on the floor must have been playing with the yarn on the floor around the chair...or the books. The back of the lamp here shows where the cord comes from. The lampshade was easy to make with the silk fabrice and french gimp. I'm pretty pleased with how this cute night light turned out. I think this would make a very nice baby shower gift or a cute night light for a little girl's room or a sweet night light for a bathroom for your cat lover friend. It is a one-of-a-kind night light. You can purchase it at http://www.shades-etc.com/novelty.htm for $35 plus shipping.